I tied the last knot on my piece of leather string and handed it to my friend sitting next to me. Nicky Nix, one of my best friends and my brother in Christ tied the string around my left ankle. I turned to my right and tied a similar string around the ankle of another of my deacon friends. We were to wear the strings around our ankles for several weeks as we prepared for the production of “The Deacon Led Living Last Supper”. That was many years ago and I marveled at the deacons who had never been on stage in their life showing a reluctant willingness to portray one of the disciples seated at the table with Jesus on the night of His last feast with them. For weeks we practiced together, we prayed together and we drew closer and closer as a deacon body until the night of our performance. Our educational minister and associate pastor at the time was Bruce Edwards. Bruce had brought the script to me and asked me to update the language for a more modern audience. The original script was written, I believe, in 1953. The script Bruce handed me didn’t even have the author’s name on it. I took a stab at the script bearing in mind which deacon would be playing which disciple. This meant that some of the monologues would have to be significantly shortened! I know some people like to post every event in their lives on Facebook. I’m a little more private. But, it has been ages since I posted on my webpage and I’d like to give everyone an update. First, I had surgery in December in Dallas and I was expecting to bounce back in a couple of weeks. Nope! Not happening! It took be a good six weeks to feel normal again. In the meantime, I am working on updating my other websites for “Hope Again” and “The Jonathan Steel Chronicles”. Also, I am working on a new website for “The Homecoming Tree”. Mark Sutton and I are working on a new book idea. I was supposed to travel to Florida to spend three days with him but we had a family medical emergency. Many of you know, if you have read my posts, that our daughter, Casey has epilepsy and today is her 32nd birthday. Last Wednesday, she fell and sustained a basilar skull fracture. No brain damage, thank God. She spent until Friday afternoon in ICU at Willis Knighton Pierremont and is at home doing well. We cancelled our trips and Sherry and I are keeping a close eye on her as she recovers. Thanks to everyone who showed up at the hospital to cheer Casey up and thanks for the many, many prayers for her recovery. I’ve been getting quite a few emails about securing permanent copies of my books. Just so you know, you can do two things. You can find copies of most of my books on Amazon at my author page at this link. Or you can go to steelchronicles.com and order copies from me directly. Thanks for supporting my books and I look forward to putting out “The 8th Demon: A Wicked Numinosity” later this year. I want to thank everyone for the thoughts and prayers the last two weeks. Those of you who knew of my surgery, I thank you. On December 4th, I had a simple prostatectomy in Dallas. The surgery went well and there is, at this time, no evidence of cancer. The surgery was for symptom relief only. But, it has placed me on my back for the last two weeks. Just a reminder I have two new books released that would make excellent Christmas gifts: The 9th Demon: Time of the Cross and The Homecoming Tree. Check them out on Amazon. Here’s hoping you have a wonderful and meaningful, peace filled Christmas and New Years. I plan on taking it as easy as possible. Imagine if you could walk the streets of ancient Jerusalem at the time of Christ. What would you see? What would you experience? Fact: The city of Jerusalem was divided into three sections. The “old” city or City of David occupied the lower southeastern corner of the city. At its northern extent towered the great Temple built by Herod. An overview of ancient Jerusalem courtesy of Bible History Online. The western city was divided into the “Lower City” and the “Upper City”. The lower city along the southern extent of Jerusalem is where the lower class citizens lived and where the marketplace could be found. The Upper City was for the elite and the well off who preferred to live as modern Romans lived. In the Upper City were large homes, Herod’s palace, a huge Theater and the Hippodrome, sight of chariot races. As you read through my new book, you may want to reference this illustration courtesy of Bible History Online. Tomorrow, I will talk more about the Temple. Enjoy. Roy Anderson is about to make the worst decision of his life and leave his family for selfish reasons on Thanksgiving day, 2001. But, thanks to the prayers of his son, an angel sends Roy back in time to 1941 with no memories. There, he will experience the true meaning of family, sacrifice, love, and commitment when he is taken in at the Collinsworth boarding house. For a U. S. Army Corps pilot, Frank Collinsworth, has not been heard from since the attack on Pearl Harbor and the family waits anxiously to see if he will return home by Christmas. Daniel, the younger Collinsworth, must decide if he will have to become the man of the house while everyone prays around the Homecoming Christmas Tree for his father’s return. Will Roy revert to the ruthless businessman he has become, or will his time spent with the Collinsworth family give him a second chance? The novel is based on a play I wrote and directed back in 2005. The 9th Demon Cover Arrives! Front Cover of the newest Jonathan Steel adventure! Available very, very soon! A darkness lies upon the land. Evil forces gather to thwart the forces of good. Unnoticed by most humans, these spiritual forces vie for human souls. All is not lost. Hope is alive. God’s warriors are called forth to fight for the good; to fight for God; to Stand against the Enemy. For we do not wrestle against flesh and blood, but against the rulers, against the authorities, against the cosmic powers over this present darkness, against the spiritual forces of evil in the heavenly places. Welcome to Area 613. In our culture dominated by cynicism, hopelessness, and despair, God touched the lives of many and uses their failures and frailties to illustrate his power and majesty. Climb the standing tree and reach out and touch God and find hope again. Welcome to Standing Tree Books. “Put on the whole armor of God, that you may be able to stand against the schemes of the devil.” Eph. 6:11 ESV. 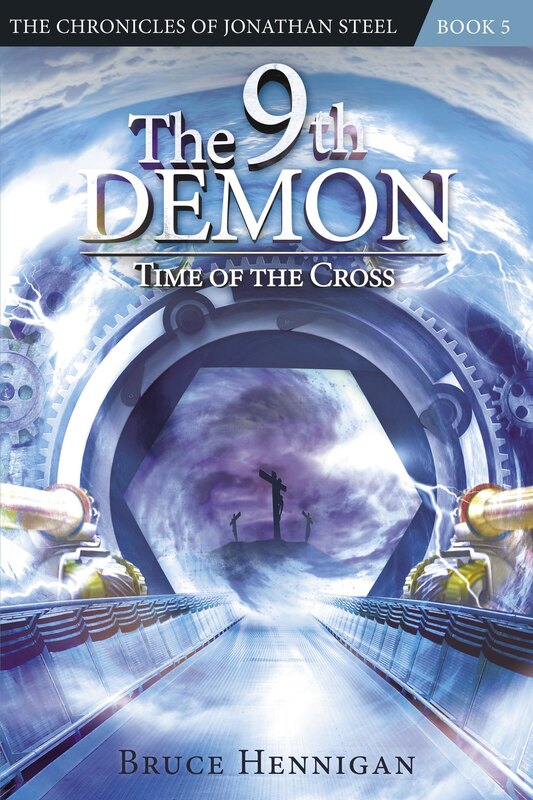 The newest Jonathan Steel Chronicles, “The 9th Demon: Time of the Cross” will be published under Area 613. My other new book, “The Homecoming Tree” will be published under Standing Tree Books. It won’t be long now!! !